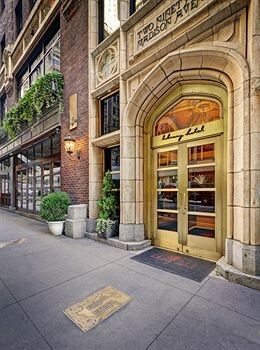 Property Location With a stay at The Library Hotel in New York (Midtown East - Grand Central), you&apos;ll be minutes from Grand Central Terminal and Chrysler Building. This 4-star hotel is close to Empire State Building and Macy&apos;s.Rooms Make yourself at home in one of the 60 air-conditioned rooms featuring refrigerators and flat-screen televisions. Cable programming and iPod docking stations are provided for your entertainment, while complimentary wireless Internet access keeps you connected. Conveniences include phones, as well as safes and desks.Rec, Spa, Premium Amenities Take in the views from a rooftop terrace and a garden and make use of amenities such as complimentary wireless Internet access.Dining Satisfy your appetite at the hotel&apos;s restaurant, which serves lunch, dinner, and brunch, or stay in and take advantage of room service (during limited hours). Meet other guests and eat at a complimentary reception. Quench your thirst with your favorite drink at a bar/lounge.Business, Other Amenities Featured amenities include a business center, dry cleaning/laundry services, and a 24-hour front desk.